A project exploring the role of East Africa in the evolution of modern humans has amassed the largest and most diverse collection of prehistoric bone harpoons ever assembled from the area. The collection offers clues about the behaviour and technology of prehistoric hunter-gatherers. "There are some huge species of fish native to this area and some of the bigger and thicker harpoons may have been used to catch species like Nile Perch, which can grow up to two metres long." East Africa is the epicentre of human evolution and its archaeological remains offer the potential to fill gaps in our understanding of early modern humans from their earliest origins, around 200,000 years ago, through to the most ‘recent’ prehistory of the last 10,000 years. The In Africa project, directed by Dr Marta Mirazón Lahr, co-founder of the Leverhulme Centre for Human Evolutionary Studies at the University of Cambridge, is seeking to do exactly that. The group believes that, in East Africa, key ecological and cultural conditions converged, which allowed modern humans to evolve new behaviours and technologies to better exploit the natural resources that they found around them. 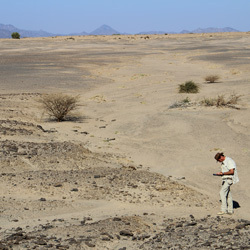 For the past five years, they has been working on the palaeoshores of Lake Turkana in Kenya, which has offered significant insights into how people there made use of aquatic resources such as fish or shellfish, something which is seen as a marker of human modernity. Dr Alex Wilshaw, in Cambridge's Department of Biological Anthropology and a fellow of St John’s College, is a Research Associate on the project. “Looking at prehistoric tools and technology is a key way of exploring when and how the cultural and behavioural traits associated with modern humans were developed,” he explains. Mirazón Lahr and Wilshaw are now preparing a monograph cataloguing and describing the harpoons to give a clearer picture of the diversity that exists within the collection. The harpoons range in date from around 13,000 years ago – late in the geological epoch known as the Pleistocene – to around 6,000 years ago, the middle of the current geological epoch known as the Holocene. The researchers used radiocarbon and other dating techniques on samples of shell and sediment surrounding the harpoons to place them in time. The research team focused their efforts on recovering remains from across an extensive landscape exhibiting the remnants of the lake edge and its surrounding flood plain. Many animal and human remains were fossilised and preserved in mud and sediment on the shores of the lake, but as the lake shrank and the environment became increasingly dry, the wind and rain eroded the surface and exposed the fossils. This phenomenon led the group to the discovery not just of the bone harpoons, but also of many other prehistoric human remains and artefacts. Published last year in Nature, such fossilised bones protruding from the earth led to the remarkable discovery of the remains of a group of hunter gatherers who were brutally massacred around 10,000 years ago at the site of Nataruk – the earliest record of inter-group violence among prehistoric nomadic people. 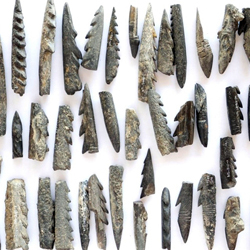 The researchers are hoping to win further funding to unlock more of the secrets of East Africa’s prehistoric harpoons. The In Africa project, which was funded by the European Research Council, aims to use its fossils and archaeological discoveries to enhance international awareness of the role of Africa in the evolution of human diversity. Inset images from the In Africa project. To keep up to date with the latest stories about Cambridge’s engagement with Africa, follow #CamAfrica on Twitter.